Today, I'm reviewing Keepers: The Greatest Films -- and Personal Favorites -- of a Moviegoing Lifetime by critic Richard Schickel. This review is part of the Summer Reading Classic Film Book Challenge hosted by Out of the Past. 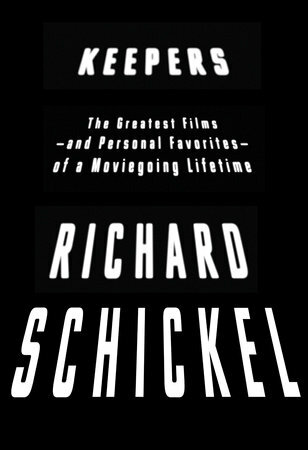 Distinguished critic and film historian Richard Schickel reflects on a lifetime of movie love in his new book, Keepers: The Greatest Films -- and Personal Favorites -- of a Moviegoing Lifetime. Schickel, a former Time magazine film critic, gives readers a very personal history of cinema through lively commentary and interesting anecdotes on the thousands of movies he has enjoyed through the years. Keepers is partly a memoir -- Schickel recounts a Wisconsin boyhood spent in movie theaters and he has many wonderful anecdotes about the actors and directors he's met over the years -- but the book is mostly a joyous celebration of the films Schickel has seen ranging from The General (1926) to Fargo (1996). Keepers is a great read for avid cinephiles: it's really fun to compare his opinions against your own (spoiler alert: I agree with him most of the time), but it's also a great book for those who want to learn more about movies. Keepers works as both a knowledgeable commentary and thorough guide for watch to watch if you're looking for a movie education. Keepers is around 300 pages, and it's written in a light entertaining style with short chapters that make it easy to pick up and put down or you can easily breeze through it in one sitting as I did. When I checked Keepers out of the library, I was expecting it to be more about modern movies, so I was pleasantly surprised to find that Schickel loves old Hollywood. By his own admission, the movies he enjoys the most are from the 1930's and 1940's, and he has many perceptive opinions about the films, directors and stars of that era. For example, he prefers the Bette Davis Civil War epic Jezebel to Gone With the Wind (I completely agree), questions the revered place of Orson Welles among American directors (I sort of agree that Citizen Kane is somewhat overrated and Welles later films never measured up to his "genius" tag, but Welles' impact on cinema is still huge), and he dismisses the Marx Brothers, complaining about Chico's "lame Italian accent" and Harpo's childlike demeanor (I completely, profoundly disagree: Chico is hilarious. I even love his piano solos). Schickel is also quite perceptive about foreign films. He covers everything from Ingmar Bergman to Yasujiro Ozu, but my favorite chapters are on the French film Children of Paradise and the chapter covering the great Italian director Federico Fellini. 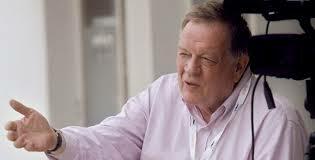 Schickel produced 30 documentaries about old Hollywood during his long career. He has a lot of entertaining anecdotes about working with actors and directors, including having dinner with Greta Garbo (Schickel describes her as fundamentally shy, but she still winked at him), eating cheesecake with James Cagney (he was a diabetic who liked to sneak sweets against his doctor's orders), and listening to tall tales from John Ford (the cantankerous director liked to entertain Schickel with a story about fainting in D.W. Griffith's arms). Keepers is published by Alfed A. Knopf. I've never read a moviegoing memoir. This one sounds really intriguing. I'd love to read it especially for those anecdotes. I'm just imagining James Cagney diving into a piece of cheesecake! Didn't he eat an ice cream sundae in a film? I'm trying to remember.